Spoilers ahead for The Walking Dead. If you’re not caught up, you have been warned! Last week’s midseason premiere of The Walking Dead was an absolute bloodbath. The episode “No Way Out” succeeded in completely captivating and thrilling the audience due to the extremely high stakes of the episode. There were an insane amount of walkers in Alexandria, and the residents seemed helpless to do anything about it. The entire episode wrapped up in a climactic battle scene where all of the residents of Alexandria took a stand and killed every single stinkin’ zombie in the place. Of course, there were still a ton of fatalities in the episode. We lost the entirety of Jessie’s family, although I can’t say that I was disappointed or surprised. Additionally, Carl’s eye popping moment finally happened so we’re presumably about to see a big change in Grimes boy moving forward. Because there was so much gore and death in “No Way Out” I would normally assume that the next episode is going to be free of any character deaths. However, the lineup for Chris Hardwick’s aftershow Talking Dead was just revealed, and it’s making me think they might send another character to meet their maker real soon. 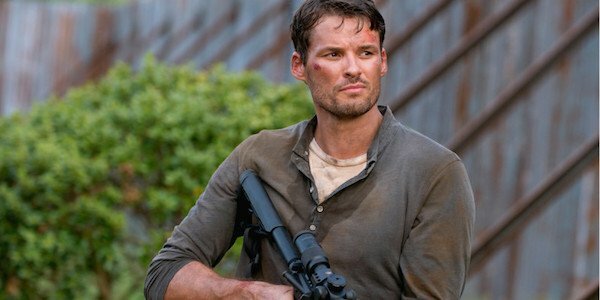 Comicbook.com is reporting that tonight’s guests for Talking Dead will include two actors from the show: Danai Gurira (Michonne) and Austin Nichols (Spencer Monroe). As we know, when big characters bite the dust in the series, they’re typically a guest on Talking Dead immediately afterward as a final goodbye. While Michonne definitely doesn’t have anything to worry about, the inclusion of Austin Nichol’s Spencer makes me think the sole Monroe survivor might die tonight. The trailer for tonight’s episode “The Next World” features Spencer prominently. While the trailers are always cryptic, it did seem like Spencer wasn’t doing so good. While he stepped up and helped in the battle for Alexandria, he was unaware that his mother Deanna had been killed the same day. Now that the dust has settled, it seems like Spencer may be going to the dark side after losing all three of his relatives. Since we’re likely going to see a zombified Deanna in tonight’s episode, it might just push Spencer past the breaking point and make him a liability or threat to the group. I already anticipated this change in Spencer due to both the trailer and logic, but now that the actor is going to appear on Chris Hardwick’s couch I think he’s going to get killed tonight. All of the actors have stated that the back half of Season 6 will just continue to get crazier. Norman Reedus likened it to an arrow- gaining momentum and speed with every episode. Considering how crazy the midseason premiere was, I think we’re in for some utter insanity for the rest of Season 6.